Since it’s the first day of October (where did September go?!) I thought it would be fun to do a tutorial on a Halloween wreath! What I love about this is that it’s Halloween without being too creepy or dark. It’s playful and whimsical and with 31 days to go until Halloween, you all have plenty of time to make one! Perhaps the best part of this project is how inexpensive felt is… you can get a yard of 72″ wide at our fabric store for $2.99. The downside to this project is that even though it’s cheap it takes quite a bit of time to make as each rose is hand rolled, but you can use a smaller wreath form and get the same effect! Start off with your felt and wreath form. 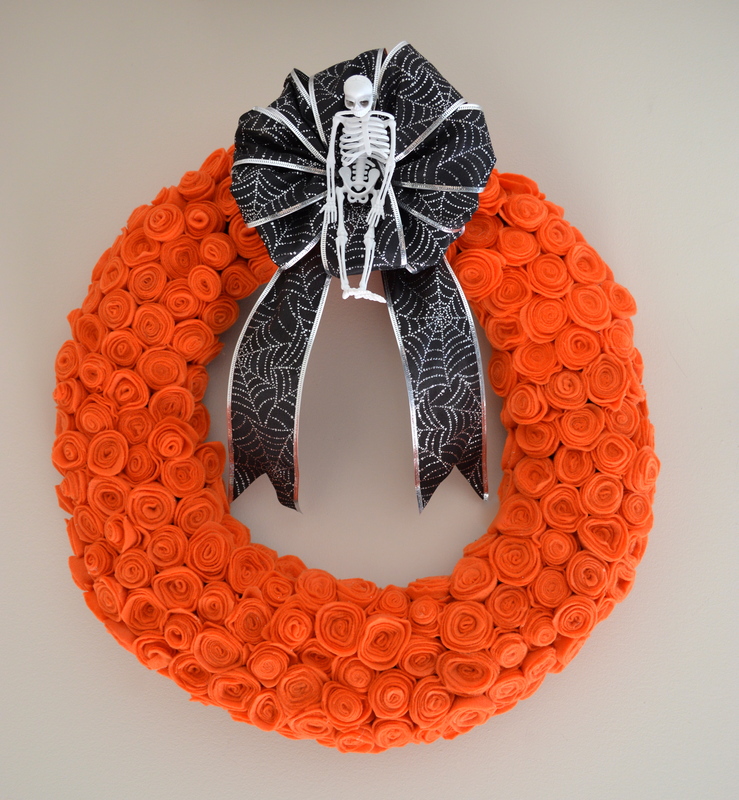 I used an 18″ x 18″ grapevine wreath form and needed two yards of 72″ wide orange felt. 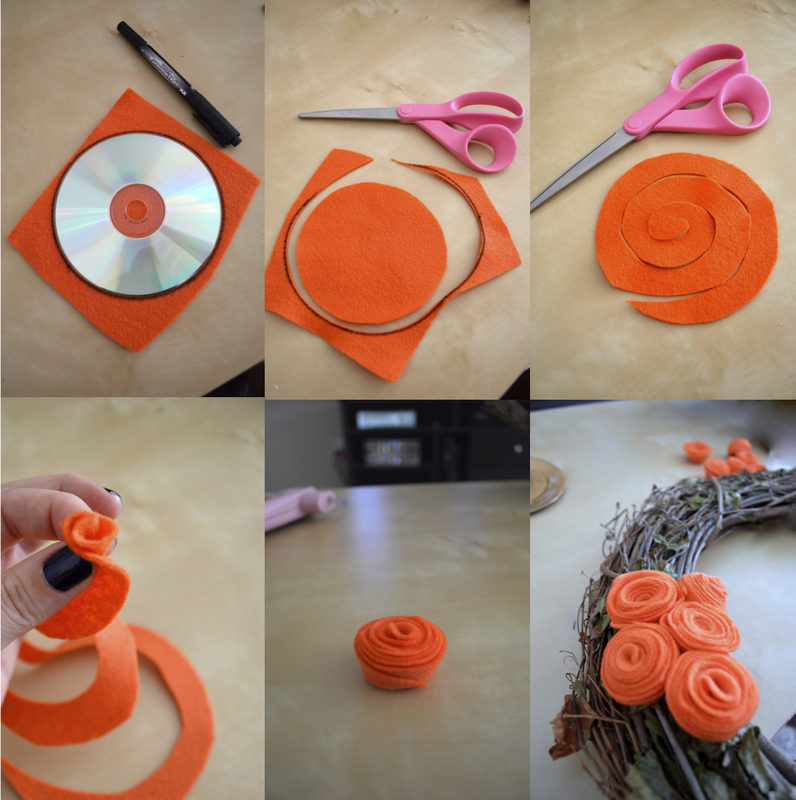 Trace a circle onto your felt using a sharpie and a cd, then cut it out. Starting from the outside working in, cut out a spiral as wide or thin as you want… the wider the spiral the smaller the flower, the thinner the bigger. I alternated rolling half of the flowers from the inside out, and half from the outside in (you can do either way or alternate like I did) and then glued the ends to secure the flower with hot glue. Once you have a bunch of flowers rolled you can start gluing them to the wreath form. Continue until the entire front and sides of the wreath are covered. 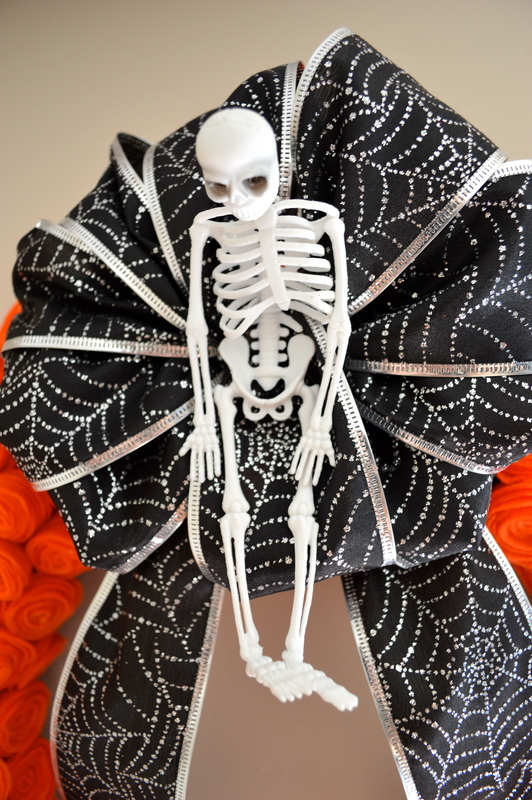 I made a big bow using thick wired ribbon with a fun spiderweb pattern in glitter and sewed a plastic skeleton to the center. I used floral wire and threaded the back of the bow through the wreath form to secure it. I tied a small piece of ribbon to one of the branches in the back of the form to hang it from. Adorable – very time consuming??? It’s not so bad once you get on a roll but yes, it is time consuming! How many roses did it take? How much felt did u buy? April, it’s been so long since I made this that I don’t recall how many roses it took but it looks like I bought 2 yards of the felt!